Young David had made quite a name for himself. Who had not heard the glorious tale? Imagine! Felling Goliath, the Philistine giant, armed with only a slingshot and his faith in the God of the armies of Israel (I Samuel 17). Word had it that such a deed would not go unrewarded. “It shall be that the man who kills him the king will enrich with great riches, will give him his daughter, and give his father’s house exemption from taxes in Israel” (vs. 25). The future looked bright for the handsome lad. From that momentous day, David served Saul wherever he was sent, and word of his exploits spread throughout the land. He soon became a familiar figure in the royal household, often soothing his tormented king with music. He and Jonathan, the king’s son, forged a lasting friendship. Did he notice the princesses Merab and Michal watching him with admiring eyes as he went about their father’s business? He often went into battle, and always returned victorious. Women danced and swayed to the rhythm of their tambourines, singing jubilantly of his conquests. “Saul has slain his thousands, and David his ten thousands.” The king’s mood turned dark toward this young hero; no rewards were forthcoming, only sudden fits of anger and malevolence. David’s acclaim grew. So did Saul’s paranoia and fear. His troubled mind devised a plan to rid himself of this perceived threat. First, there was the promise of Merab’s hand in marriage. Just fight for me, the king had said, hoping for David’s death in battle, and you can have her to wife. But when David failed to fall into his trap, Merab was abruptly given to another. Then word came that his younger daughter Michal was in love with David, and Saul immediately saw her as the snare to bring this interloper’s demise. It became increasingly clear that life with Saul was going to be a challenge. Michal could hardly believe it. David provided the bride-price Saul requested: one hundred foreskins of his enemies, the Philistines–in fact he doubled it. Only after a tally of the grisly payment were they allowed to wed. When her father should have felt secure as David repeatedly proved his loyalty, he only grew more obsessed. Even her brother Jonathan couldn’t reason with him, and became alarmed at their father’s murderous intent. What could she do? Even in the dark, she felt the presence of her father’s assassins waiting near the courtyard below. Slowly a plan crystallized. Perhaps it was her trusted servants, or even Jonathan himself who helped her quietly lower David from her window to the ground. She leaned out after him, watching him disappear into the inky night. Now she must move quickly. Her father’s messengers of death could enter her room at any time. Michal managed to pivot a household image onto David’s bed, and disguise it with goats’ hair and clothing. After a few minor adjustments she was satisfied it would pass for her sleeping husband—at least temporarily. By the time Saul’s henchmen discovered her ruse David was well on his way to Ramah. Saul’s rage would not be cooled until David was dead, that he proved by an endless, merciless pursuit. Michal’s fugitive husband was forced farther and farther away. There was spotty news of him now, usually from the mouth of an itinerate tradesman, and what little she did receive only caused her heartbreak and despair. Could it be true—he had another wife…was her name Abigail? And then another? Why had he not sent for her? As if unknowing was not enough, her father did the unthinkable. He gave Michal as wife to another, one Paltiel, and with the passing years, she made a new life. When she learned that her father and brother were killed in battle, there was still no word from David—only reports that he had been made the king of Judah. Now some fourteen years later, David laid claim to the throne of Israel in order to unify its tribes with Judah. Once again Michal found herself helpless, now in the midst of a contest for a united monarchy. Key to David’s ascendency as she was his rightful wife and daughter of Israel’s deceased king, he wasted no time in demanding her return. In spite of Paltiel’s tearful pleadings, Michal now found herself in David’s palace. Once again she stood at her window, drawn by sounds of trumpets and shouts of jubilation. The ark of the Lord was coming to Jerusalem! As she watched the nearing crowd, she spied her husband, leaping and whirling, in an ephod. Disgust filled her heart. He should have stayed a shepherd. Such dancing in public and he, the King! The Woman’s Study Bible, Topic “Michal,” says, “Fourteen years later and seven years after the death of Saul, David was still not the king over all of Israel. 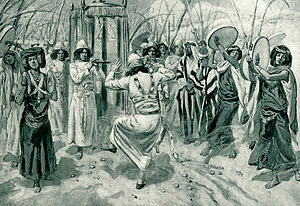 As condition of a treaty with Abner, David demanded the return of Michal in order to stabilize his position over the Kingdom. Once again, Michal was used for political advantage” (page 475). The ephod was a linen vest worn by a priest over his robe. It was much shorter than the usual outer garment, which made it convenient for dancing. The Woman’s Study Bible, reference, 2 Samuel 6:14. Posted in David, Faith, Michal, Saul, Tribes of Israel, Uncategorized. Bookmark the permalink.